Listen below to Eric Bass discussing Voices of Community on Vermont Public Radio. Step into the future with the power of a strong community! We are pleased to bring critically acclaimed actress, writer and theater based educator, Anu Yadav to the area as part of the Voices of Community series coming up November 13th – 20th. Anu Yadav is dedicated to telling the stories of people pushed to the margins of public discourse and as a solo performer Anu shape-shifts into characters from everyday life with both humor and drama. Her devised theater work sparks a powerful forum for people to reflect and listen to each other’s stories across social and economic divides. On Thursday November 17th and Friday November 18th at 8 PM at Next Stage see the performance of ‘Capers, a stirring blend of theater, documentary and activism. ‘Capers is a one-woman show based on the stories of families at DC’s Arthur Capper/Carrollsburg public housing projects – nicknamed ‘Capers – who protested the government-funded demolition of their neighborhood. $18 general admission and $16 students/seniors. On Wednesday November 15th Join Anu’s workshop, The Art of Listening, form 6:00 – 8:00 PM at Next Stage for $10. In this workshop you will learn about theater-based strategies that can support community organizing. This workshop addresses key concepts in listening, power and privilege, identity, unconscious bias, and ethics within theater-making. 12:00 – 1:30 PM at 118 Elliot. A good conversation is energizing! Reserve your tickets today. There are many amazing community events, performances, workshops to participate in! Copyright © 2015, Sandglass Theater. All rights reserved. Don’t give up, Speak up! 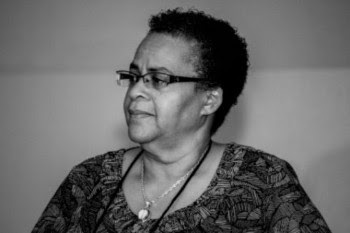 At this pivotal post-election time we are honored to welcome award-winning playwright, activist and theater artist, Linda Parris-Bailey to our area. Her nationally recognized work focuses a community towards moral health and positive action. Come participate and see how powerful a story can be. Linda Parris-Bailey is primary Playwright-in-Residence and Executive/Artistic Director of the Knoxville, TN-based Carpetbag Theatre Inc., “a professional, multigenerational ensemble company dedicated to the production of new works giving artistic voice to the issues and dreams of people who have been silenced by racism, classism, sexism, ageism, homophobia, and other forms of oppression.” Her story-based plays with music focused on themes of transformation and empowerment. 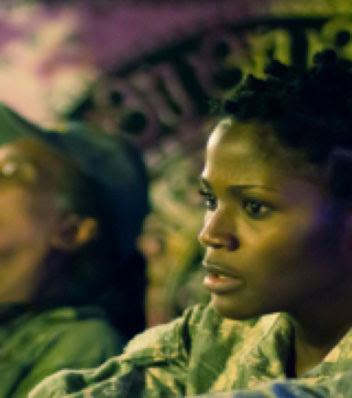 Speed Killed My Cousin is a stunning new play by Linda Parris­-Bailey, rooted in the story of an African American female combat soldier and her struggle with post­ traumatic stress disorder upon her return home from Iraq. A third generation soldier, the central character courts death by vehicular suicide. With support from the New England Foundation for the Arts’ National Theater Project (with lead funding from the Andrew W. Mellon Foundation). See this play at Next Stage on Saturday November 19 at 7 PM or Sunday November 20th at 2 PM. Movement and voice exercises that improve fitness and wellness activities for warriors and their families. Leadership naturally emerges from these exchanges as people take charge of their own process and story. The role of the visiting artists and workshop leaders is to transfer skills that will strengthen existing peer mentorship programs, such as the Tampa PRRC “Voices of Recovery” group, and develop new leadership where arts-based programs do not currently exist. In addition, public performances and dialogues raise awareness about veteran’s issues, educate the public, connect veterans to the larger community, and build bridges of understanding. Join Linda’s workshop on Wednesday November 16th from 4 – 5:30 PM at Next Stage. Join the Artist/Activist Lunchtime Conversation with Linda Parris-Baily and Don Spencer of Ruck Up as they are interviewed by Jon Potter on Wednesday November 16th from 12 – 1:30 PM at 118 Elliot. CLICK HERE to reserve your tickets for these and other Voices of Community events. PUTNEY – Sandglass Theater’s Voices of Community series has always been good medicine, but this year it’s being delivered in a powerful, more concentrated dose. 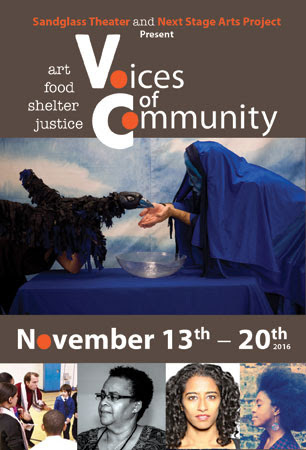 From Nov. 13 through 20, the Putney-based puppet and theater company will be hosting a slate of events that includes performances, workshops, panel discussions, conversations, meals, school outreach events, a dance party and more, all under the banner of Voices of Community: Art, Food, Shelter, Justice. Since 2005, Sandglass’ Voices of Community series has brought theater artists to the area for performances and community connection around issues of race, gender and disability. Those performances were often spread out over a few months. This year, Sandglass has packed a robust lineup into one week, aiming for impact. What hasn’t changed is Sandglass’ interest in performance and outreach around issues of race, class and social justice. What’s new this year are some of the issues being looked at and the extent of the outreach programs. Headlining the festival are three performances by artists with unique gifts for enlightening and entertaining. 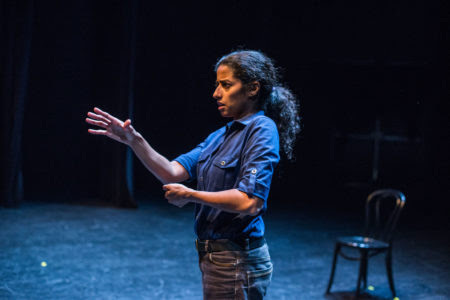 On Thursday and Friday, Nov. 17 and 18, at 8 p.m., Anu Nadav will present “Capers,” a one-woman show hailed as a stirring blend of theater, documentation and activism. “Capers” tells the stories of families who demonstrated against the government-funded demolition of their Washington, D.C., housing project. Tickets are $18, $16 for students and seniors, and the performance takes place at Putney’s Next Stage, which is a presenting partner of Voices of Community. On Saturday, Nov. 19, at 7 p.m., and Sunday, Nov. 20, at 2 p.m., at Next Stage, Voices of Community presents “Speed Killed My Cousin,” a stunning new play by Linda Parris-Bailey, rooted in the story of an African American female combat soldier and her struggle with post-traumatic stress disorder upon her return home from Iraq. Tickets are $18, $16 for students and seniors and there are free tickets for veterans. “The subject of her piece is moral injury, which is different from Post Traumatic Stress Disorder. It has to do with mental anxiety for people doing something against their values,” said Bass. On Thursday, Nov. 17, at 9 and 11 a.m., at the Latchis Theatre in Brattleboro, school groups will be treated to Heart of the Beast Puppet and Mask Theater’s “Are You Thirsty?”, a dynamic exploration of the myriad questions contained in a cup of water – one of our most precious and necessary shared resources. Tickets are $6, $8 for adults not attending with a school group. “All these artists have strong feelings and points of view about their subjects, but ultimately, they’re all interested in community dialogue rather than propaganda,” said Bass. And that certainly feeds into another important aspect of Voices of Community. Taking a cue from its name, the week-long festival features many programs based on gathering, telling and hearing stories from the various voices in our community. Story circle events for the public include Carlton Turner’s “Facilitating Story Circles” on Monday, Nov. 14, at 4 p.m., at Landmark College, Anu Yadav’s “The Art of Listening” on Tuesday, Nov. 15 at 4 p.m., at Next Stage, “Digital Storytelling” with Linda Parris-Bailer on Wednesday, Nov. 16, at 4 p.m., at Next Stage, and, on Sunday, Nov. 20, at 11:15 a.m., Will McAdam’s “Moving Forward/Making Change” at Next Stage. All these workshops are $10. There are other story workshops for student groups at Brattleboro Union High School, the Putney School and Putney Central School. The public is welcome at these, with admission at $8. See voicesofcommunity.org for details. 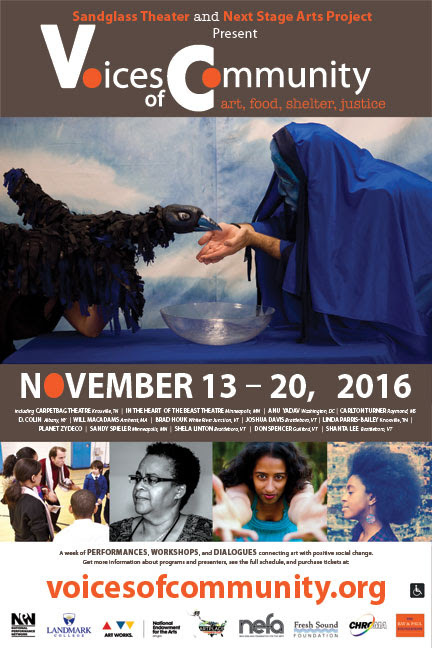 Other outreach programs include a mask-making workshop and Sandy Spieler’s Production for the Whole Community, both on Saturday, Nov. 19. There are also several other community engagement opportunities, starting on Sunday, Nov. 13, at 11:30 a.m., at Next Stage with a free event gathering people to build a community installation. That night, everyone can kick up their heels and open their minds with a Zydeco Dance Party and Spoken Word Rap with music by Planet Zydeco from 7 to 10 p.m., at Next Stage. Admission is $15. There are Artist/Activist Lunchtime Conversations at noon on Monday, Nov. 14, Wednesday, Nov. 16, and Thursday, Nov. 17, at noon at 118 Elliot in Brattleboro, as well as two Loaves and Fishes Roundtable Conversations about food, a Farm To Table Farm Dinner on Thursday, Nov. 16, a free conversation on Art, Food, Shelter and Justice with Shanta Lee of the Arts Council of Windham County on Saturday, Nov. 19, and a free presentation on Saturday, Nov. 19, at the Putney Public Library on Art and Water.